"WIde-angle camera connects with an app (available for iPhone and Android) and lets you play accordingly, even dispensing treats from afar." "Each sock has its own cat personality to match whatever you are feeling that day." "You can easily program when you want feeding times with the digital timer and can set the meal times for consecutive days." "Get your cat’s brain working as they explore, pounce, scratch, and sniff their way to a treat or toy." "It’s made from durable wood, soft faux fur, and bulky rope—all perfect for scratching." "All sides of the lightweight carrier are mesh so that your pet can view the world as they please, and you can easily check on them." "Convenient, easy to use, and will keep your house smelling fresh." "An adorable way to keep track of your to-do lists and add some feline fun to a room." 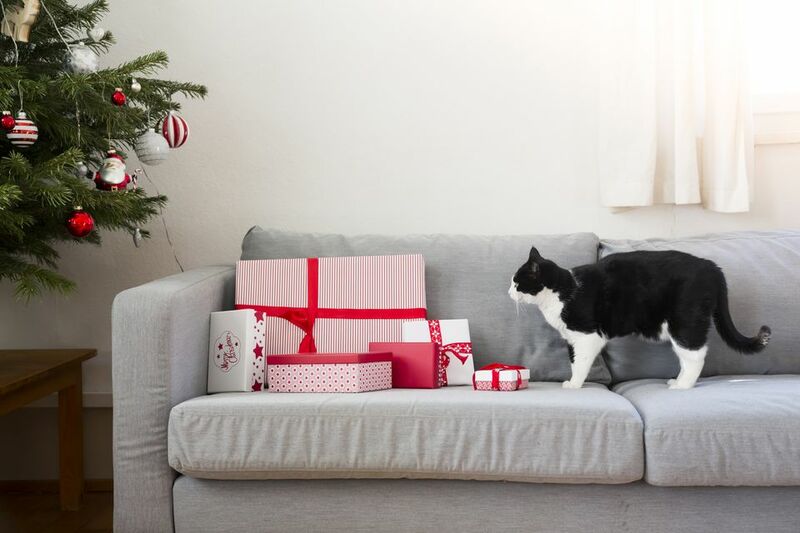 If you are worried that your cat is bored when you are away, use the Petzi Treat Cam to watch, speak, take photos of, and even give your furry friend a treat. Connect the wi-fi enabled camera inside your home where your cat frequents often and get ready to see what their day is like when you are away. The wide-angle camera connects with an app (available for iPhone and Android) and lets you play accordingly, even dispensing treats from afar. The camera is 8.8 inches tall. Want to take a look at some other options? See our guide to the best pet cameras. With cat sweatshirts, mugs, and hats adorning clothing racks at stores, being a cat-lady isn’t a bad thing anymore. Show your love for these creatures by sporting a variety of brightly colored cat socks. With the Meta-U Cute Cat Socks, you’ll get five crew cut pairs to wear underneath your slacks or show off with a fun skirt. Each sock has it’s own cat personality to match whatever you are feeling that day—smiling, dreaming, sunning, wondering, and playing. The socks are a mix of cotton and polyester and are machine washable. Sometimes your schedule makes it difficult to be home in time to feed your pets or perhaps you have a grazer who wants to snack all day. The PetSafe Automatic Pet Feeder is a five, 1-cup portion feeder that works well for both dry and wet foods. You can easily program when you want feeding times with the digital timer and can set the meal times for consecutive days. The automatic feeder is cat proof, though food-obsessed dogs will be able to break into this. The feeding tray is dishwasher safe. The system takes 4D batteries (not included) and is 15 by 18 inches large. Of course, your cat is the smartest cat ever. Don’t let it get bored during the day, though. Instead, spoil it with the Cat Treat Maze and Puzzle Box Game by Cat Amazing. This low priced cat toy is an interactive treat puzzle that will keep your cat amused even when alone. The box has three sections—easy, medium, and hard—to get your cat’s brain working as they explore, pounce, scratch, and sniff their way to a treat or toy, depending on which section you decide to use. The box is 14 inches long, 9 inches wide, and 3.5 inches tall. It is made from a sturdy, durable cardboard. Want to take a look at some other options? See our guide to the best cat toys. Get your kitties moving with the Cat Tree by Go Pet Club. The beige playground is 51 inches high with a 19 by 19 inch base. It has two perches for jumping between and resting, a hanging toy for entertainment, and a cozy cubby to hide in when your feline friend needs a break. With a sturdy base, the condo won’t tip over, but can be bolted to the wall if need be. It’s made from durable wood, soft faux fur, and bulky rope—all perfect for scratching. This house is ideal for smaller cats (5-10 pounds) as the perches and the cubby won’t accommodate very large cats. Take a peek at some of the other best cat trees you can buy. For owners who travel often with their cats, choose the AmazonBasics Soft-Sided Pet Travel Carrier. This soft-sided but sturdy carrier has two lengthy handles for carrying, as well as an adjustable over-the-shoulder strap. The carrier has two zippered entrances: one entrance at the front of the carrier that unzips for your cat to crawl into, as well as a zippered entrance on top for your cat to pop their head out of. All sides of the lightweight carrier are mesh so that your pet can view the world as they please, and you can easily check on them. The carrier comes with a machine washable fleece pet bed and will fit easily under the seat on most airlines. The extra small is 14 by 9 by 9 inches with a recommended pet weight of 8 pounds; the medium is 16.5 by 9.4 by 9.8 inches with a recommended pet weight of 16 pounds; the large is 19.7 by 10.2 by 11.2 inches with a recommended pet weight of 22 pounds. To figure out which size your cat will best fit into, measure from their neck to the base of their tail and from the floor to the top of their shoulder. Although this self-cleaning litter box is at a higher price point than others on the market, the scoop-free, self-cleaning litter box by PetSafe is convenient, easy to use, and will keep your house smelling fresh. The litter box uses crystal litter that absorbs waste quickly to decrease odor and is also locked away in a leak-proof tray. About once a month, exchange the tray for a new one (sold separately) without ever having to see or smell your cat’s waste. The timer is adjustable with three different options for when to rake and also has a counter to track how often your cat uses the bathroom. Colors include bright purple or neutral taupe. The covered litter box is 17 inches high. Interested in reading more reviews? Take a look at our selection of the best cat litter boxes. Use this in your home office, your kitchen, or at work. Wherever you put it, the Post-It Cat Figure Pop-Up Note Dispenser is an adorable way to keep track of your to-do lists and add some feline fun to a room. The cat dispenser comes with one pack of pop-up notes. For even more cat fun, bundle the post-it note dispenser with the tape dispenser or cat-themed duct tape, too.